Here's another update on my current skin condition after the 3rd sessions of the laser as promised. I apologized for taking this long to update my current skin condition. But I thought that it would be more appropriate to blog after a few sessions of lasers so you guys could see the obvious improvements! I've mentioned this time to time on my blog posts, I'm not blessed with good skin and I'm thankful that the technology has become so advanced and some of the machines that were used have helped a lot in my skin issues. Arrived on time for my appointment (finally lol) and waited about 5 - 10mins for Dr. Ram! I was really nervous, considering I've never done any laser in my entire life and this was the first. Dr. Ram has assured me that the pain level is almost similar to an ant bite. Was brought to the treatment room after I've cleansed my face. Blocking my eyes cause I look really fatigue here... Hahahahahaha. You can see very clearly here, this is my former skin condition. 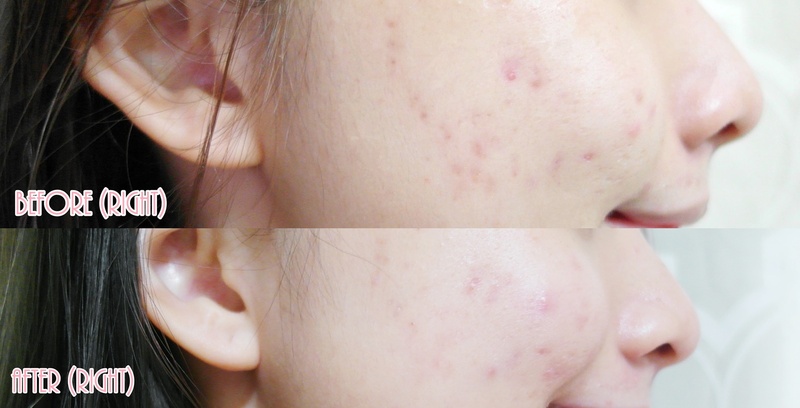 Scars that was left by annoying inflamed acne. AND these scars are able to pop out new zit, again and again, therefore, Dr. Ram has prescribed me a month of antibacterial pills. Yucks, I'm grossed out by looking at my pictures too, don't worry. Lol. This is the cooling gel. Before starting the laser procedure, the therapist will apply the cooling gel on my skin. The laser treatment took about 30 - 45 mins, I couldn't capture the process of the treatment as my eyes were covered! It was totally tolerable if you ask me about the discomfort level. But I have to admit that it stung so bad after the treatment - the part where they wiped on some liquid on my face (but that only last about 2 - 3 mins). I was also informed on mild peeling for my skin for the first 3 days, so I avoid makeup for a week to be safe! The first 3 weeks of June, I had only tinted sunscreen on when I head to school or work. I didn't want to trigger my skin any further during the process of healing and I'm thankful that the peeling only took me about 5 days after the 2nd sessions. 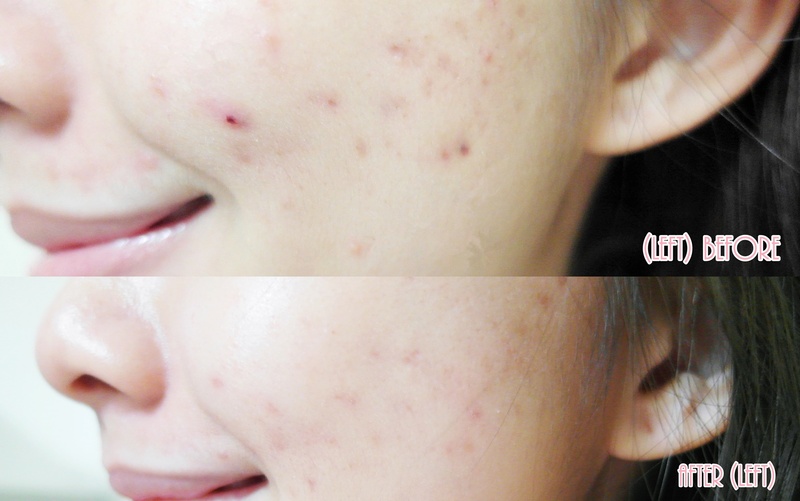 For the first session, it lasted one week and my skin felt really smooth after the peeling. Skin renewal I guess? Lol. Can you see a huge difference? 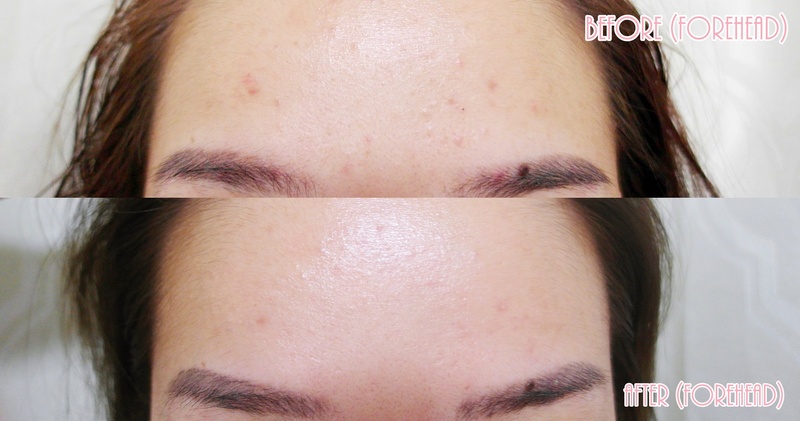 My forehead comedones and darker spots area have cleared up so much all thanks the laser and the comedones solution! Left cheeks, clearly notice the visible improvements after the 3rd laser~ P/S: Totally non-edited, I only adjust a bit of lighting in the pictures for you to see even clearer. Right cheeks, I couldn't be happier after seeing these pictures. If I did not do any lasers, it'd probably take me months or years for it to heal. Very grateful and made the right choice to be part of The Wellness Clinic Family. I'm not paid to do up this post, most y'all knew I've done a shift for my skincare sponsor since June and have never regret any bit. I will not speak positivity about the services/product if it doesn't work for me, I'm sharing this with you guys because Dr. Ram holds up his words and assured me a lot of my skin issues. The visible results have shown it all. Let's move on to Facial which was arranged on the 25th of July. Pictures were taken by my front camera iPhone, and I had no idea why the scars appeared to be less visible here?? Lol. Non-edited I swear hahaha. After the massage, the therapist used this infuser which will help in exfoliating and deep cleansing. This is the part where it will help in unclogging your pores and remove the dead skin cells. This is also to prep for a better extraction later. Another machine tools that help in removing your white and blackheads, yikes. Feels good that I finally got them removed from my face! Looooook at this..... This is only like the 2% of it I think? Hahahaha. After double cleansing? Extraction time, which I didn't manage to get a photo because I'm focusing and bearing the pain lol. The therapist was very meticulous during the extractions, the whole extractions took about 30 mins? And I'm glad that the pain was bearable. After the extractions, I was brought to another treatment room. The therapist recommended a treatment that will help in brightening my dull skin and also kill the bacteria in my skin. I guess it is almost similar to what I've done in my former skincare sponsor. The red light penetrate into your skin and kills the bacteria. The treatment process was a little bit uncomfortable as I can feel the heat on my skin. #thepainforbeauty you see. It took about 10-15mins? Thank God. After the treatment, I was lead back to the facial room. The second last step. The therapist applied vitamin serum along with this machine roller on my skin. The process of it was really painful but I was told that it is really good for my skin. Again, #thepainforbeauty #worthit. Complete the facial with a mask that will help in hydrating and brighten my skin! The mask feels very cooling and the best part was the cooling sensations doesn't wear off at all. Overall review: I had an enjoyable facial time at The Wellness Clinic and it is also my first time doing my facial over there. Definitely, a pleasant 2 hours experienced. It is also very important to have a skillful therapist to get your face done. You wouldn't want to leave the place with marks all over right? Pretty much camera ready anytime after the facial and laser lol. Thanks for reading!